Here's one more way of staying connected to the web no matter where you are – with the use if a Verizon Jetpack! 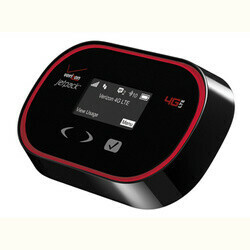 This pocket-friendly gizmo is a newly-announced mobile Wi-Fi hotspot that runs on the carrier's speedy 4G LTE network. It can be yours for only $19.99, as long as you don't mind waiting for a $50 mail-in rebate and signing a new two-year contract with Verizon. Developed by Novatel Wireless, the Verizon Jetpack can provide Wi-Fi internet access to as many as 10 devices, all the while ensuring that the connection is secure through the use of WPA2/WEP encryption and VPN support. It is equipped with a screen, on which the user can monitor their data usage in real time, if needed. That's pretty neat for something that costs less than 20 bucks. Verizon will be offering the Jetpack mobile hotspot online starting January 31, and then have it in stock at stores as well in the coming weeks. Is anyone interested in getting one? Too bad can't get it for that price with out new contract. Would go great with my unlimited data plan! Jetpacks can't be on an unlimited data plan regardless. most jetpacks take a different sized SIM anyways but if you did have a model that took micro switching it automatically changes the device and priceplan in VZ's backend system. I said too bad...don't hate that I have unlimited! haha im not hatin, I still have my unlimited too! Hey why not give it away, since they are ripping you off for the tiered data plan. WHat's the use of a gee-whiz hotspot if it cost you a fortune to keep connected? Well a thumbs down for no good reason is hating. Listed as software upgradeable for LTE on AWS, where would that be an advantage over the 4260LE. You lose GSM world roaming.